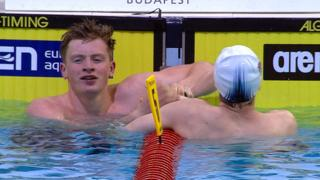 Great Britain's Adam Peaty wins gold in the 100m breaststroke ahead of team-mate Ross Murdoch at the European Swimming Championships in Berlin. 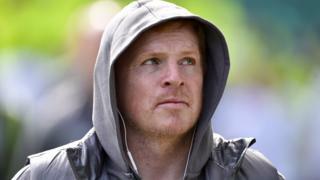 Peaty touched the wall in a time of 58.96 seconds despite finishing poorly, 0.47 seconds ahead of Murdoch, who picked up the silver medal. Lithuania's Giedrius Titenis finished third ahead of the Olympic champion over 200m, Daniel Gyurta of Hungary.